Heat oven to 425°F (400°F for a dark or nonstick baking sheet). Lightly grease a baking sheet with cooking spray. 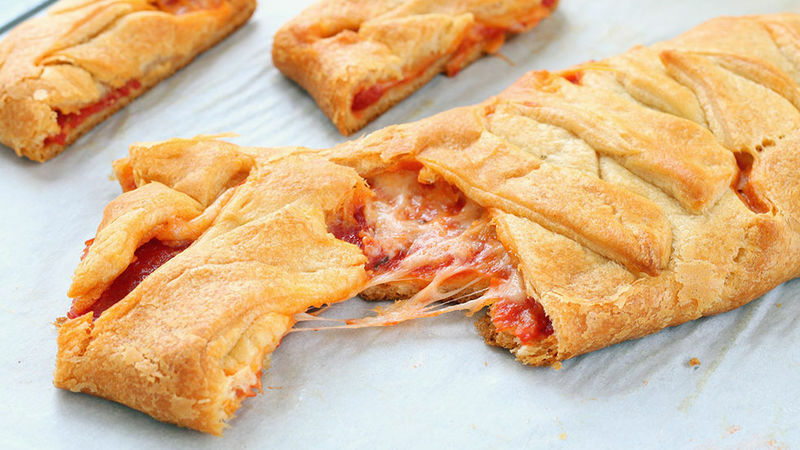 Unroll pizza crust and press into a 10-by-13-inch rectangle on prepared baking sheet. Use kitchen scissors or a knife to cut 8 equal strips along each of the two longer edges, leaving a 3-inch space down the centre of the dough rectangle. Spoon pizza sauce along the centre of the pizza dough, then sprinkle with 3/4 cup of the shredded cheese. Top with 1/3 cup of pepperoni slices, then sprinkle with another 3/4 cup shredded cheese and remaining 1/3 cup pepperonis. Starting from one end, fold strips of dough over the filling to the centre, so the ends overlap and it looks braided. Sprinkle top with remaining cheese and a few more slices of pepperoni. Bake 20 minutes until crust is golden brown and baked through and cheese is melted and bubbly. For a vegetarian version, swap pepperoni for spinach, peppers, mushrooms and/or olives.